The old Boy Scout refrain is quite apropos when it comes to staying on plan with weight loss and fitness. Yes, it means more planning, but that’s the small price to pay for the huge benefits you are bound to accrue for your efforts. 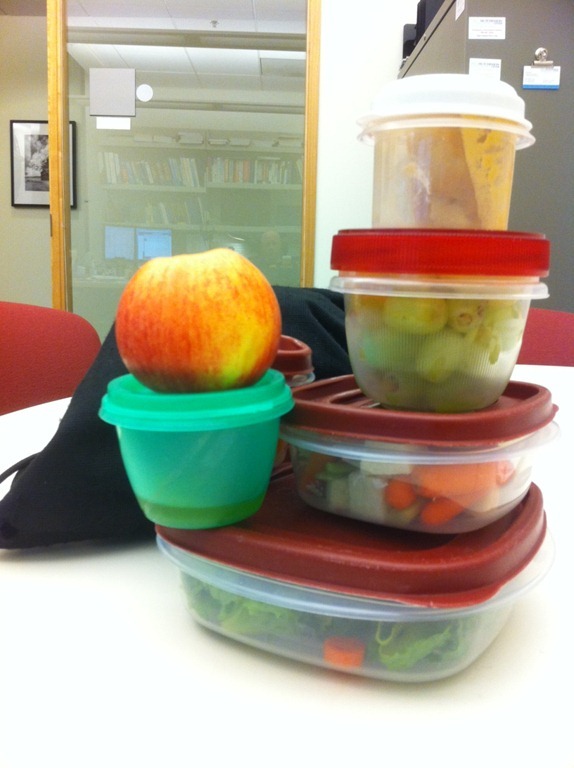 My tower of containers for Monday includes a green salad with veggies and 1.7 ounces of left over baked salmon (yes, I weighed it); 1 tablespoon balsamic & olive oil salad dressing; some cherry tomatoes for the salad (separated because I don’t like to refrigerate tomatoes); jicama, celery, and carrots; 2 tablespoons of hummus; half-cup of grapes; and a small Fuji apple. What’s that you say? A lot of containers. Precisely, I answer. But this is how I stay on plan and how I don’t break the budgets (money and calories).